Our best collection for those seeking to advance and discover the depths of meditation in both the Taoist or Buddhist traditions. In order to reach the goal of longevity and spiritual enlightenment, the Qigong practitioner must learn Internal Elixir Qigong. The first step to learning is to understand the theory and the method of Embryonic Breathing. Practicing this breathing technique will help you to establish your central energy system, conserve your energy, and store this energy to abundant levels. Once you have established this foundation, you will be able to practice Small Cyclic Heaven (Small Circulation or Microcosmic Orbit) and Grand Cyclic Heaven (Grand Circulation of Macrocosmic Orbit) effectively. Bundle contains 2 books and 2 DVDs. To reach the goal of longevity and spiritual enlightenment, the first step is to understand the theory and the method of Embryonic Breathing then you will be able to practice Small and Grand Circulation effectively. Without this foundation, the root of spiritual enlightenment will not be established and the study and the practice of meditation, will be in vain. Embryonic Breathing theory and techniques were kept secret in Buddhist and Daoist (Taoist) monasteries. Dr. Yang discusses most of the available documents, translates and comments upon them. Scientific analysis and summary of the practice methods. A comprehensive, straightforward way to understand and practice Embryonic Breathing. Also known as ‘back to childhood breathing’, this qigong meditation technique is the foundation of internal cultivation and advanced practice. Dr. Yang presents a clear and fascinating explanation of his Qigong theory in a home seminar you won't want to miss. This program is a must for Qigong practitioners, acupuncturists, meditators, and anyone interested in understanding exactly how and why Qigong works. Small Circulation Meditation builds the body from weak to strong and trains the mind to be calm and focused. Dr. Yang presents a modern method for learning Small Circulation safely. Includes scientific analysis, translation and commentary of ancient documents, and a summary of the practice methods. Though meditation is popular today for relaxation and general health, the ultimate goal of this training, in both Daoism (Taoism) and Buddhism, is spiritual enlightenment. Small Circulation Meditation builds the body from weak to strong and trains the mind to be calm and focused. Dr. Yang presents a modern method for learning safely. Includes scientific analysis, translation and commentary of ancient documents, and a summary of the practice methods. Small Circulation provides abundant Qi energy to the circulatory system branching out to the entire body. The practice can improve your general health, and it is a fundamental step in the practice of spiritual enlightenment meditation. 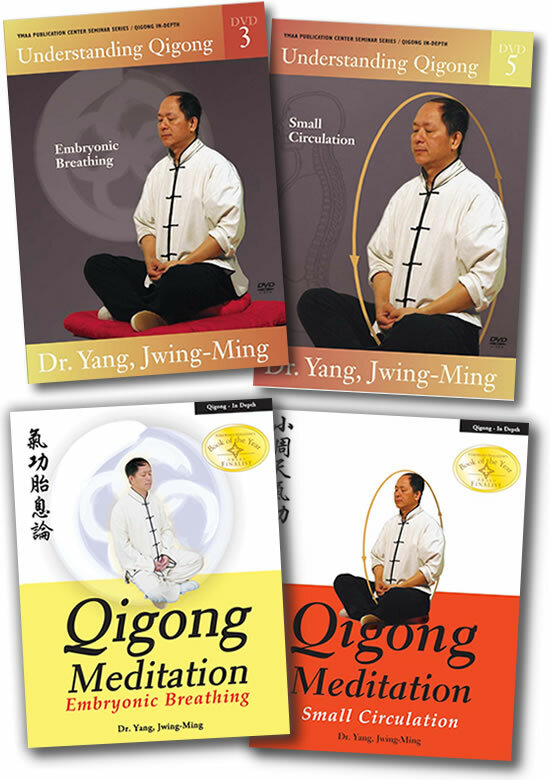 Dr. Yang's systematic approach to teaching offers deep insight into the ancient art of Qigong with modern scientific data to support his theory from both an Eastern and Western perspective. This program is a must for serious qigong students, meditators, and healers, and it is recommended for yoga practitioners interested in studying the internal side of practice. Dr. Yang offers a review of his qigong theory as it pertains to Small Circulation. Learn about the key turning Qi points in qigong meditation. Understand the differences between traditional and modified practice. Dr. Yang offers advice on how to safely start your own small circulation practice.